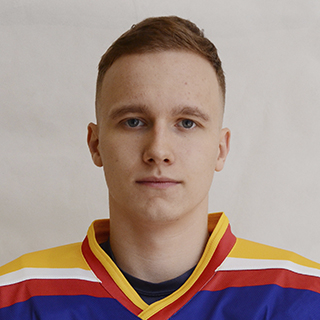 Stalnye Lisy Magnitogorsk forward Ilya Avramenko shared his hockey story with Junior Hockey League media relations department. The 19-year-old just finished his 3rd JHL season. I was born in Magnitogorsk and fell in love with hockey because of my grandfather. When I was a kid he would take me to the rink and I would practice there for 4-6 hours. I was three years old when my grandfather taught me everything. Alexander Ovechkin was my favorite hockey player growing up. I don’t have any siblings but my cousin Andrei also plays hockey. My cousin Katya is a very smart kid. She’s in painting school and she participates in city competitions. My first coach at Metallurg junior hockey school was Evgeny Anatolievich Razumnikov. Under his command our team was always among the top. Our 1998 team often won tournaments. I would say Igor Shvyryov was one of the most talented players on that team. We began playing together. I’m very glad that such a talented player went to play for Colorado’s AHL affiliate. As for defensemen, I would say it’s Grigory Dronov. Actually, we had a pretty good team. I remember my Junior Hockey League debut very well. I played my first game for U18 Team Russia against Atlanty Mytischi. I began the game on the third line with Igor Geraskin and Mikhail Mescheryakov. We won 5-0 and I scored my first career JHL goal in that game. I couldn’t score on a penalty shot but I still have vivid and positive memories of that game. It helped me mentally that I scored that goal because I was a little frustrated after I had failed to convert on the penalty shot. My teammates congratulated me and I still have the puck at my place. I my debut season I didn’t play a single game for Stalnye Lisy. I moved to Novogorsk in June to join U18 Team Russia. In 2016 we lost in the playoffs to Krasnaya Armiya Moscow because we had many inexperienced and young players on our team. We were swept in the series. I didn’t feel any difference between Western and Eastern conferences. There are strong teams in both of them. I can’t say for certain that the East is weaker than the West. I picked #98 for my jersey myself because I used to wear #8 when I was a kid. I really like the number. 98 is the year of my birth and my favorite number is also in there. Stalnye Lisy had a good season and finished 2nd in the Eastern Conference. We didn’t get any luck in the opening series against Reaktor Nizhnekamsk. We lost Game 5 but the series was exciting and very emotional. It’s tough to say what went wrong. We were in the right mindset, we were pumped and certain we would win but sometimes we just lacked those lucky bounces. We created a lot of scoring chances in the offensive zone and even missed wide-open net a few times. In Game we could have scored in overtime but we didn’t manage to. I believe, we played better than Nizhnekamsk but we couldn’t capitalize on it. I made my VHL debut for Zauralie in the game against Torpedo Ust-Kamenogorsk from Kazakhstan. I remember there were a lot of people in the stands. That’s when I felt that the pace of the game was very different, there was less room than in Junior Hockey League and the players were better developed physically. We had a really good group of guys and I felt welcome on the team. My teammates gave me a lot of advice and helped, especially Alexei Chechin. Thanks to their help I adapted to VHL rather quickly. This year I got my feet wet in JHL and VHL playoffs. It would take me 5-6 hours to get from Magnitogorsk to Kurgan but I didn’t feel tired at all because it was important to me to play as often as possible. I’m glad to be needed as a player. In the future I would like to play as often as possible as well. I can’t say that Belye Medvedi Chelyabinsk are the toughest team to play against for us in the Eastern Conference. Every game against Chelyabinsk is a rivalry game but every Eastern Junior Hockey League team is good. It’s just that we have a different mindset coming into game against Belye Medvedi. It’s always exciting to play against them. We are very grateful to the fans who to our games in Magnitogorsk. We always do our best not just to win for them but also play beautiful hockey. We really want the fans to come to our games and cheer for us as if we were the pro team. I’m a hard-working person. I try to work on my shortcomings and develop my upsides. You have to make progress in hockey every year. I’m not superstitious because things like that only get in the way. One day I figured out that you shouldn’t focus on that and the most important thing is to keep improving. I enjoy going to Metallurg games in the KHL. I try to notice how everybody plays and learn something from those experienced players. Among Russian forwards I like Nikita Gusev, Nikita Kucherov and Artemy Panarin. Nikita Gusev is a wonderful player. There aren’t many hockey players who can see the ice so well. I enjoy watching NHL games as well, I try to follow multiple teams. I scored my very first goal as a kid in a game against Salavat Yulaev junior hockey school team. That goal literally turned everything around for me. Since then all I wanted to do was scoring goals. That’s when I realized that hockey was my game. It was a very vivid moment in my life. I will also always remember one goal I scored for U18 Team Russia against the Slovaks. I was named player of the game after that.